Hooray! Starbucks Coffee Philippines loves Mother Earth! 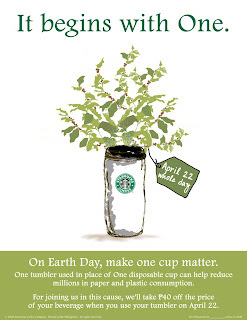 ON APRIL 22, 2008, Earth Day, Starbucks will be treating you to a Php 40 discount if you USE YOUR OWN TUMBLER/MUG in purchasing any of your favorite beverage at any Starbucks store in the Philippines. • We recommend customers participating in this campaign to bring tumblers that have the proper insulation for either warm or cold drinks. • Bottled water and pre-packed juices are not included in this campaign. This is a nice campaign. Must mark this date.